Do you love bike? Do you love being in the company of spirited people? Come and ride with us on our amazing single trails! With this package in mountain bike hotels in Livigno we are sure that you will find not only the best hospitality, but also all the services that bikers need! 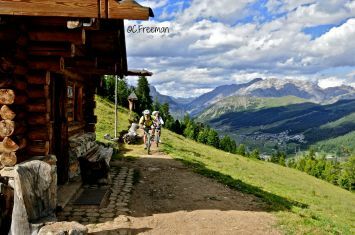 Livigno and its surroundings are really be ideal for mountain biking holidays, given the variety of the landscape and the many paths by which you can try. If we can have deals for holidays in Valtellina as these mtb Hotel Loredana, even better! The nature of the Stelvio National Park and the Engadine, enriched with great emotions the most adrenaline mountain bike trails in Livigno. With a natural setting of such relief, your trips on your bike will be even more surreal. The Valtellina is certainly the place to go mountain biking, since it has so many visitors to the tracks of any kind, services, and a special bikepark for bikers, such as the Mottolino! many types of trails: flow country trails, cross-country, freeride, single track! Valtellina is undoubtedly tied to the theme of the kitchen. Those who love the mountains, love because it is always a pleasure to enjoy good food, especially after the daily grind that you can do on the pedals. The mountain bike makes you hungry and the Restaurant at Hotel Loredana is there on purpose to appease its. We also organize evenings with Valtellina’s menu, the best way to know the area beginning with her ​​recipes!